Last Sunday's race was a real joy to take part in. Not so much because of the result, but it was the pleasant surroundings of the Surrey lanes in the June sunshine that really added the feel-good factor. The third round of the Women's Team series was held at Chobham, close to the leafy affluent suburbs of Chertsey and Virginia Water. Having not done a Women's Team series race since 2005, this felt like a new race for me. It was also going to be just my second race on the open road this year. This shouldn't have been a daunting prospect for me, but it was. I always get nervous before races - especially national level races - where I get a bit psyched out by the competition. Also my track record for these races has never been good. In 2005 I learned alot about riding 2-up and 3-up time trials at the tail end of many a road race ! The start list for the race still had a number of speedy women - quite a few who had spent this season thrashing me on an almost weekly basis. So I wasn't expecting any surprises. What did reassure me though, was the presence of more than a couple of women who were of a similar ability to me. At least I knew I would get into a group. 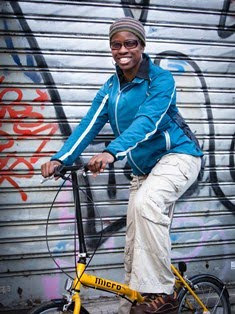 Furthermore, the National Circuit Race Championships were taking place up North, so a number of national level riders, such as Nicole Cooke's Halfords Bike Hut girls were missing. 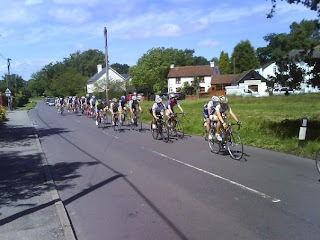 Our race was likely to be a slightly meatier version of the South East Championships that took place last month. The race began in earnest at 11am, under the watch of many spectators and a few curious locals. We had 10 laps of a large circuit, followed by 3 laps of a short circuit to complete. Having calculated that I would have lost enough time on the leaders to be pulled out between laps 9 and 10, I hadn't bothered to recce the short circuit ! After a first lap in which the 40 strong peloton stayed together, the first digs were made. With Fatbirds CC, Team Luciano, Surrey League, and Twickenham CC all having strong teams their riders were the ones who took turns to do damage to the pack. Every time we climbed the hill leading out of Chobham there was a power surge, followed by a spurt up to the roundabout, an acceleration out of the corner and an attack down the Bagshot road. This proved a bit too much for the non-climbers, so a few people were off the back on the second lap. For my part, I had to remain focused and remind myself that I could handle it. I kept telling myself that the pain from the attack would be temporary, and I would recover and survive with the bunch. I also tried to remember the training sessions I'd done, and remind myself that what I was doing here would be no worse than what I had done in the those sessions. So with this in mind, I felt slightly less anxious about dealing with the attacks. However, I still wasn't confident enough to move up the bunch. So I spent most of the time at the back of the pack. Occassionally I moved to the middle, but I didn't dare go anywhere near the front. Inevitably when a break went off the front on the fifth lap, I was too far back to actually realise what had happened - and even if I had known, there was nothing I could have done. In any case, as I was guest riding for Team QCP, and one of my team mates, Yorkshire Regional Champion, Sarah Cramoysan was in that break I didn't really need to do much. So with 7 riders in the break, which included 2 Surrey League women, plus one woman from each of most teams the pace of our 15 strong group slowed down as everything was neutralised by the Surrey League riders. It was good to have a breather, but after a few laps it began to get a bit silly as the pace slowed right down, people got a bit bored and started chatting about their holidays, life and the universe etc, and so the break gained 4 minutes. When we realised we might get caught by the stragglers we decided to get our act together. We were later joined by Susie from Surrey League, who was not feeling on form and had been dropped by the escapees. As I looked around at the people in my group, I couldn't quite believe that I had actually managed to hang on. 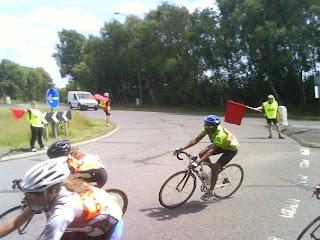 Yes, I was still holding up the rear, but I had had no difficulty keeping up. Here I was with 3 fast Surrey League riders (Jo Munden, Susie Osborne, Jen Hewitt) a couple of Team Lucianos (Heather Summers, Jackie Garner) some Fat Birds (Michelle Buck, Lizzie Goodband, Tracey Fletcher), the Agisko Viners and the stronger Twickenham ladies. I think alot of people were surprised to see me there. No one was more surprised than me though ! The last section of the course involved the 3 short laps that I hadn't recce'd. It turned out to be half a mile of grinding uphill back to the main road. These 3 laps passed very quickly, and even more as things became very lively. Tac-tics came into play as the Surrey league women discussed what they would do - Susie Osborne and Nikki Wheeler who had been hanging around at the back (with me) made their move to the front, and people began to amble up ready for the uphill sprint to the chequered flag. For me, this part of the script hadn't been written out, so I had to improvise what to do. And as jostling for position in a bike race is by no means my strength, I left it a bit late to start my sprint from the back. Oh dear, when I reached the chequered flag I realised I'd run out of road ! So I finished 11th out of our group of 15. With the lead group of 6 ahead, that put me 17th overall. Lesson - I should follow Nikki or Susie's wheel next time ! Ok, so I just had a bunch finish, but for me I was still very pleased with how the race had gone - mainly because I had survived the initial attacks and stayed with the group. I'd enjoyed my race in the sunshine. I think money must have been lost by a number of folks who'd seen me lap after lap believing that this one would be my last one in the group ! 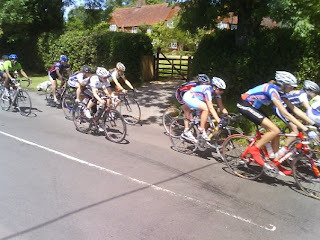 The race was won by Rachel Osborn (Newport Shropshire CC). 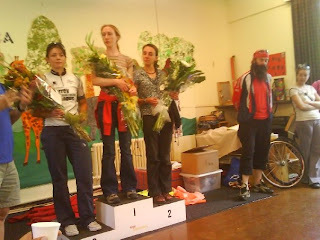 The podium was completed by Dorothea Cockerell (Twickenham CC) and Rebecca Curley (Surrey League/London Dynamo). 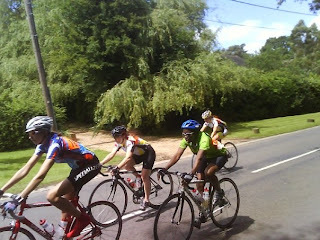 My QCP team mate Sarah Cramoysan (who normally rides for Team Swift) finished 4th. It was a good day all round - then myself and Fred (who had ridden over to watch) rewarded ourselves with a big lunch and beer at a local country pub. Bring on the sunshine.